The Kings Kids are a Christian punk rock band out of Salinas, California. The band started in the summer of 2004 when Jason Martinez was inspired by the lack of punk bands at Spirit West Coast that year. Soon he teamed up with guitarist Josh Galvan, and the songwriting process gave fruit to more than a dozen songs that would later make up their debut album Urgency!, released in June 2008. By that time, Lupe Gutierrez had joined on bass, and Milo Zavala came on board for the drumming duties in early 2010. After a number of changes to the line-up, The Kings Kids currently consists of Jason, Josh, Lupe, and Milo. The Kings Kids boldly deliver a message of faith and truth while standing firmly on the musical shoulders of Rancid, Swingin’ Utters, Ramones, Street Dogs and The Clash. 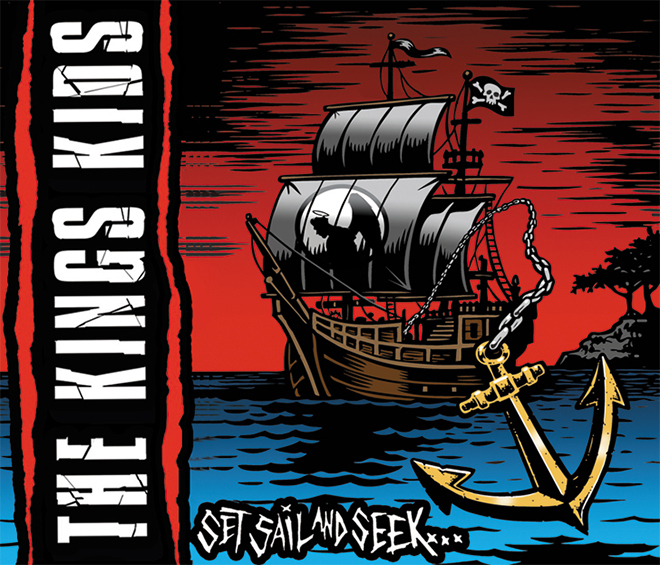 The Kings Kids have now released their second full length, Set Sail and Seek… Produced by Cliffy Huntington, yes the same Cliffy Huntington of Main Line Riders and Huntingtons fame. It’s a joy of listening to this band. They maintain the definitive old school punk sound that was prevalent in the ’70s and ’80s. Not that I don’t mind the current pop songs that are passed off as being “punk”, but The Kings Kids put out the real thing. Christ shines through on the lyrics of the 14 tracks found on Set Sail and Seek… The numerous Scriptural references in The Kings Kids songs are treasures to be discovered. “So Much More” the lyrics snap out and are bolstered by great guitar and powerful drum bridge section on the song. “6 AM” is probably the catchiest song on the album. I often find myself singing along with the chorus, “6 AM in the morning …” as I drive down the highway. “Jim Braddock”, a tribute to the “Cinderella Man”, James Braddock. A capsulation of the story of the career of the famous boxer. It recounts the trials and difficulties Braddock had and how he rose above these challenges. An apt analogy of our journey to and with Christ. “The Lighthouse”, an acoustic track that is out of chracter with the rest of the album, but one that draws you into a quiet and reflective time with with Lord. The Kings Kids, Set Sail and Seek… is earnest, raw, fun, and awesome! Check it out at Thumper Punk Records.